TSA's Head Of Security Kelly Hoggan 'Removed' From Office, House Oversight Committee Says : The Two-Way The Oversight Committee has criticized TSA for giving Kelly Hoggan bonuses despite security problems under his leadership. The agency has also been under fire for long screening lines for travelers. TSA agents work at a security checkpoint at Newark Liberty International Airport in New Jersey on Monday. The House committee says the head of security for TSA has been removed from his post after inquiries into the agency's management. The head of security for the Transportation Security Administration, Kelly Hoggan, has been removed from his position after a hearing about the agency's management, the House Oversight Committee says. On Tuesday, Secretary for Homeland Security Jeh Johnson confirmed on NPR's Morning Edition that Hoggan is being removed from his post. In an email obtained from the TSA, Administrator Peter Neffenger announced a series of leadership changes on Monday. The position that Hoggan had held since 2013 will temporarily be taken by Darby LaJoye, who is currently deputy assistant administrator. The changes come as fliers complain about long, slow airport screening lines. That problem "has many parts," as NPR's Brian Naylor has reported: More people are traveling, and there are fewer screeners. The May 12 hearing looked into attrition as well as management accountability. The committee says Hoggan received more than $90,000 in bonuses between November 2013 and November 2014, "despite significant security vulnerabilities." Lawmakers accused TSA of surreptitiously giving the payments in $10,000 increments, NBC News reports. NBC adds that during the hearing, Administrator Neffenger said that he did not think the "level of bonus is justified," but that he didn't have plans to fire Hoggan. 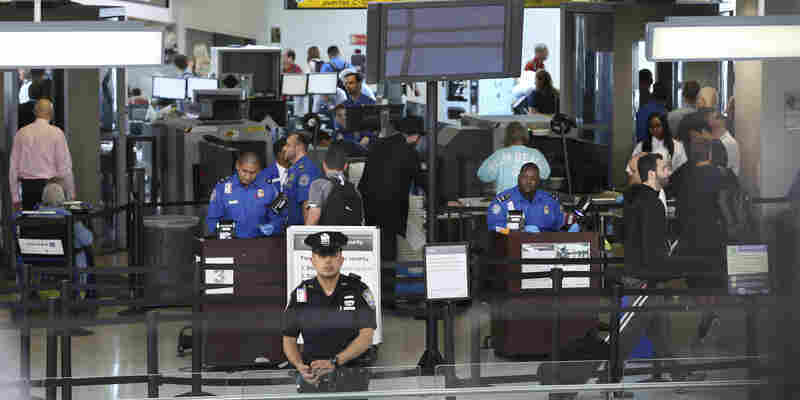 "Congress gave the TSA authority to hire more than 700 new screeners, who are expected by mid-June, and the agency is redeploying others. It will also be making additional use of canine teams to help screen passengers, as well as stepping up marketing of the TSA Pre-Check program, which allows passengers who undergo a background check and pay $85 to go through expedited screening." "I want the American public to know that we're aggressively focused on this and working with Congress to get the resources the TSA needs," Johnson, the secretary for homeland security, said Tuesday. In Monday's email, Neffenger said he had put in place a new leadership team at Chicago O'Hare International, infamous for travel delays, and said he had appointed Rod Allison, director of the Federal Air Marshal Service, as the deputy chief of operations. LaJoye, taking Hoggan's position "effective immediately," has worked as federal security director at Los Angeles International Airport and John F. Kennedy International Airport in New York.